To the average person a 1-degree rise in average spring and summer temperatures may not seem like much. But for residents of the western United States—including California, which is fighting at least eight fires right now—it could mean a staggering increase in the extent and cost of fires according to a recent study. In their report, researchers at Headwaters Economics, an independent nonprofit research group in Bozeman, MT, predict that climate change and the accelerating movement of western residents to areas near or in undeveloped forests will likely prove to be a devastating combination. That 1-degree increase in spring and summer temperatures, they conclude, will increase the area burned by seasonal fires in Montana by more than 300 percent and more than double the cost of protecting homes threatened by fire. Though the Headwaters paper focuses on Montana, using data from 18 large fires in the state during 2006 and 2007, it has implications for fire-prone areas throughout the Rocky Mountain West. And it builds on a growing body of evidence that inaction on climate change will cost the western United States dearly. Earlier this summer, for example, Harvard University scientists published a study in the Journal of Geophysical Research predicting that areas burned by wildfires in the West could increase by 50 percent by 2050, with even larger increases of 75 percent to 175 percent in the Pacific Northwest and Rocky Mountain West. Those increases could have “large impacts on human health” because of the added smoke and particulates released into the air, the study said. Federal and state agencies responsible for fighting western wildfires, particularly the United States Forest Service, are already struggling to cope with the rapidly increasing costs of protecting lives and property. Since 2000, wildland fires in the United States have burned an average of more than 7 million acres a year, about double the average acreage for the previous four decades. Federal firefighting costs have also risen dramatically, according to the Government Accountability Office, averaging $2.9 billion per year from fiscal 2001-2005 compared to $1.1 billion in the previous five-year period. The Headwaters study predicts that state wildland firefighting costs in Montana will double to quadruple by 2025. The increasing popularity of building homes in or near forested areas, known as the wildland-urban interface, or WUI, is a major factor in the escalating costs of fire suppression. 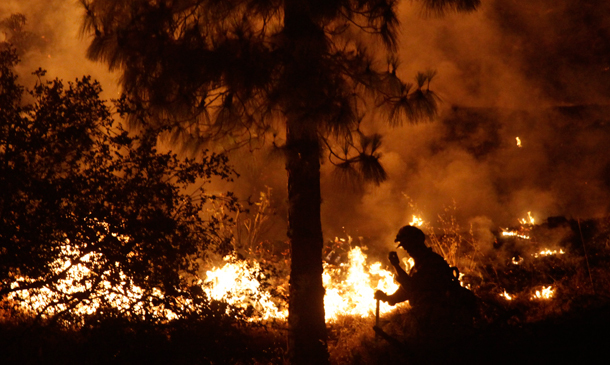 A 2006 report by the Department of Agriculture’s Office of Inspector General found that “the majority of [Forest Service] large fire suppression costs are directly linked to protecting private property in the WUI,” with Forest Service managers estimating between 50 and 95 percent of large fire costs spent on that purpose alone. Though federal agencies shoulder the major financial burden for protecting those homes, development decisions in wild areas are made by local and state officials. Climate change and its impacts on temperature, drought, and snowpack runoff will affect fires as well as many other aspects of life in the West. Climate models predict that global warming will significantly reduce snow runoff in the West, the region’s major source of water. A study published in April by the Scripps Institution of Oceanography estimated that the Colorado River, the lifeline for 27 million people in the Southwest, will not be able to produce its allocated water supply 60 percent to 90 percent of the time by mid-century. That would have major impacts on food production, recreation, and development in the fastest-growing region in the nation. It will also mean forests will dry out sooner, with a likely increase in fire activity. And in recent years, a widespread and so far unchecked epidemic of mountain pine beetles that has killed millions of acres of trees from Colorado north into Canada has laid the foundation for a potentially large increase in catastrophic fires. Climate change has played a role in that outbreak, too, as warmer winters spare the beetles from low temperatures that would normally kill them off, and drought stresses trees. In the western United States, mountain pine beetles have killed some 6.5 million acres of forest, according to the Associated Press. As large as that path of destruction is, it’s dwarfed by the 35 million acres killed in British Columbia, which has experienced a rash of forest fires this summer that as of early this month had burned more than 155,000 acres. In the United States to date about 5.2 million acres—an area larger than Massachusetts—have burned this year. Destruction of trees by the mountain pine beetle, combined with climate change and fire, makes for a dangerous feedback loop. Dead forests sequester less carbon dioxide. Burning forests release lots of carbon dioxide into the atmosphere. More carbon dioxide adds to climate change, which raises temperatures, stresses forests, and makes more and bigger fires more likely.